A Black Bear cub spends his time in a tree waiting for the return of his mother in the wilderness in Canada, North America. The perfect safe haven for a black bear cub is high in a tree while his mother searches the area for food to feed to her baby in Canada, North America. Tree climbing is something that a baby Black Bear learns fairly quickly as they spend a fair amount of time high in a tree to keep away from any danger that may be lurking around. 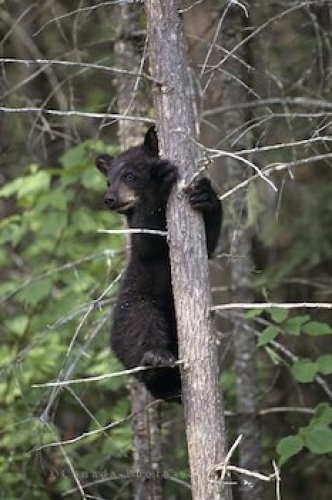 Picture of a baby black bear waiting patiently for his mother in a tree in Canada, North America.